Any escape plan? Why did they continue normal daily life? Why take car and tell people "We are the Marathon Bombers"? Where did they get gunpowder and guns? What was their motivation? 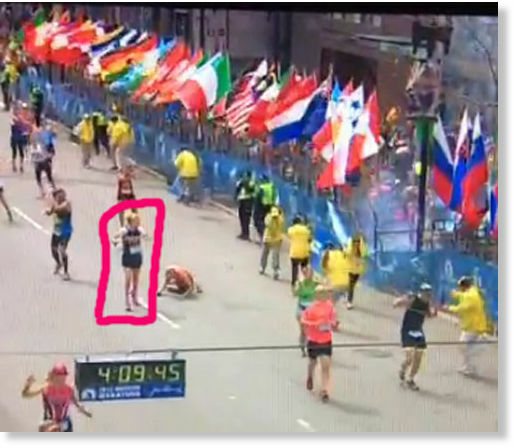 Were there crisis actors at the Marathon? Were there fake bombs? How many people were really injured? Any investigative reporting of the bombings? The first part of this three part series on the Boston Marathon Bombings covered reports in the media about circumstances which do not fit the Official Story. (http://australianvoice.livejournal.com/3499.htm) These reports may or may not be accurate, but they generally take the form of a person or persons being reported to have seen or heard something not in the story. This second part raises a series of questions about the Official Story which involve interpretation of aspects of the bombing. They are simple questions which 50 or 100 years ago would have been followed up by journalists who actually investigated events, rather than "reporting" them. "Let's assume tough guy Tamerlan and his impressionable brother Dzhokhar were actually responsible (no FBI in the picture). After so much planning there had to be an immediate escape route - as in transportation, passports, money, plane tickets. There was nothing. Dzhokhar went to school, worked out in the gym, socialized, sent Twitter messages. The other is from Paul Craig Roberts. "When is the last time the media investigated anything? A good candidate for investigation is the post-bombing rampage the brothers allegedly went on, robbing a 7/11 store (later contradicted by local police), killing a campus policeman, shooting a transit cop, high-jacking a SUV and releasing the owner. There are many more questions which could be examined, including: Where did the brothers get the gunpowder? 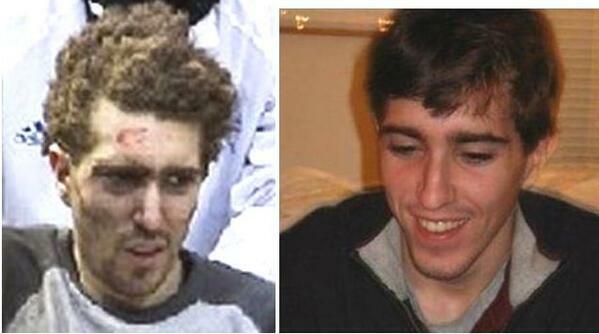 What did Tamerlan and Dzhokhar do in the hours or days following the bombing? Is there any independent confirmation of the police reports of robberies, chases, gun battles, etc. Did the brothers even have any weapons? If they did, where did they get them? The fact that these simple questions have been ignored shows the complete control over the US media which has stopped all investigative journalism in recent years. Let's begin with their motivation. One account can be found in an article which appeared in AlterNet entitled "The Boston Bomber Brothers Got the Attention They Wanted." It was written by Paul Campos, a Professor of Law at the University of Colorado at Boulder. In saying this he is just repeating the assessment of the two brothers given by Ruslan Tsarni, their uncle who helped arm the Chechen separatists and was married the daughter of a high ranking official in the CIA. (4) The point seems to be that the brothers were misfits and outcasts, who just wanted to lash out at a society which they could not join. However, a casual look at the lives of these two brothers shows nothing of the sort. By all accounts they were rather successful as migrants to the US. Their uncle is almost certainly lying on instructions from his contacts in the CIA. In fact, one of the more bizarre features of the Official Story is that they are not the sort of young men you would expect to set off a murderous explosive device at a popular sporting event in the town where they lived. And even if they were "losers," does this provide any real insight into their motivation? "Today's headlines include 'Boston Bombing Suspects Motivated by Iraq, Afghanistan Wars.' The world responds with a resounding: Well, duh - Of course they were motivated by those wars! That's a no-brainer." "Many young people have been radicalized by knowledge of the realities of the Iraq and Afghan wars. They've come to understand that they live in an imperialist country run by a 1% who care nothing for human life, whose military does not even bother to keep figures on civilian casualties. Such radicalization is entirely appropriate. May it spread!" For Professor Leupp and many others, there is nothing wrong with being radicalized by these events. The problem is that "what really seems to have happened was that the brothers were increasingly drawn to a terror-validating strain of extreme Islam, which the preponderance of Muslims see as a travesty of the religion." Oddly, this is exactly the same motivation which now forms part of the Official Story. Dzhokhar himself is alleged to have provided it in writing since he was captured, and even before, while hiding out in that boat. The question for the FBI and Professor Leupp is this: What EVIDENCE is there for the claim that they accepted a "terror-validating strain of extreme Islam"? Was it the simple fact that Tamerlan and Dzhokhar were known to be Muslims? They planted bombs at the Boston Marathon, so they must have taken up a terror-validating strain of extreme Islam? What else could possibly explain why a Muslim would undertake a terrorist attack in the US? Of course Professor Leupp would think the Tsarnaevs' mother was lying when she said Tamerlan was controlled by the FBI and never talked about jihad. Her statement can be safely ignored by all sane people. Apart from planting bombs at the Marathon, they seem to be completely unremarkable or even normal for their age, mixing successfully in a range of social activities and studies. What is more, Professor Leupp notices another interesting fact about them. They seemed to suppose "that they could walk away from the crime scene smiling and go on with their lives as usual." In other words, in addition to behaving normally before the bombing, they continued to behave in the same normal way after the bombing. Surely this is a clear sign they were moral monsters! So were they actually normal? Professor Leupp's account of their motivation is no better than the one discussed first. The claim that the Tsarnaev brothers' motivation comes from their being radicalized by the US aggression in Iraq and Afghanistan only makes sense with the assumption of some kind of Islamophobia. Are Muslims really a different species from the rest of us? Many of us, including Professor Leupp himself, are radicalized and enraged by the wars of the US, but we do not turn to terrorism as a result. So, why would a basically normal couple of young Muslim men turn to terrorism even if they are radicalized? If the brothers had any anger about US wars, and it appears they did not, this no more explains this sort of behaviour than does being a misfit. The idea that angry Muslims commit terrorist acts is a right-wing fiction. Behind virtually all terrorist attacks is the shadow of the security services of the West, the CIA, FBI, Mossad, etc. The 21st century jihad is a creature of Saudi ideology spread, organized and financed by these intelligence agencies. Without this worldwide support it simply would not exist. While it has been created and used by the West, it still must be managed so that the manipulated followers will only attack the right targets at the right time. Therefore the West plays a double game, secretly feeding these groups while openly opposing them. This makes it appear that they act independently of and against the interest of the West. Neither the public nor the jihadis themselves understand the roles they play in this dirty game which Pepe Escobar calls the Empire of Chaos. Is the man in the wheelchair Jeff Bauman? This may seem to be an irrelevant question. However, the person in the wheelchair shown in the story from the New York Times is not the injured Jeff Bauman, who is he? 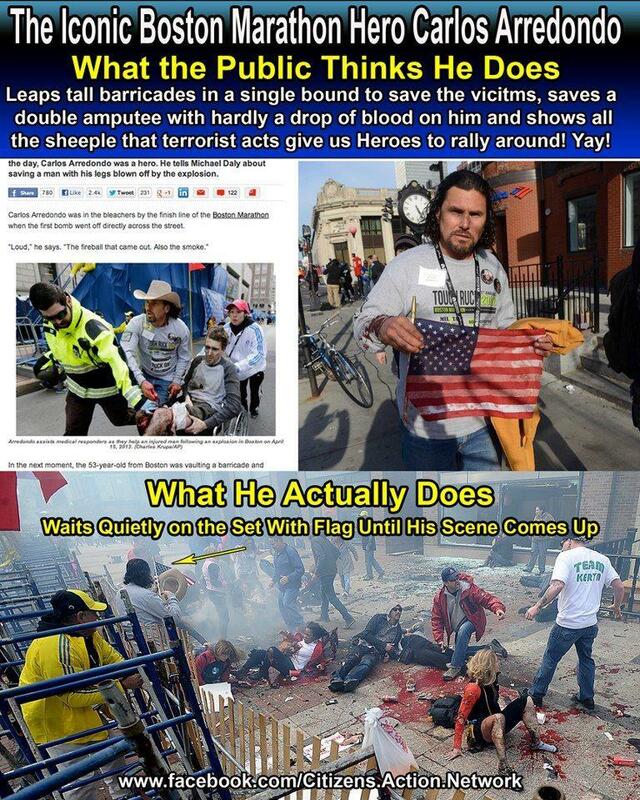 Was he just another injured spectator was he a crisis actor mistakenly identified by Jeff Bauman's father? 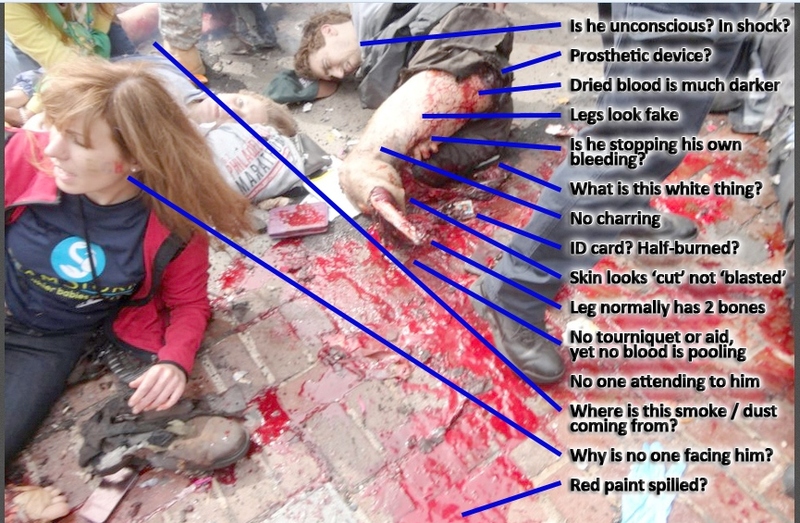 Were there fake injuries and crisis actors in Boston? It is clear such people exist and are used in training exercises. Were they used at the Boston Marathon? In the article B'Man goes through several frames which he claims shows where and when a fake prosthetic leg is installed on the amputee seen in PHOTO G. The comments on PHOTO G raise several important questions: Is this photo of real blood and a real severed leg or a prosthetic device? Why is the skin of the leg is not charred and seems to be cut? Why does the leg only have one bone showing? Why is there no tourniquet or pool of blood? Where is the excess skin and muscle? The author of the article from which this analysis is taken also goes through the forms of identification used during FEMA exercises. His comment about Alexander (Carlos) Arredondo - seen in PHOTO D as the man with the white cowboy hat - is as follows: "I have a question about the guy in the 'cowboy hat'... who is he? If he is just a volunteer why isn't he wearing a volunteer shirt...yet he has a nametag. Hmmmmm...."(16) His point is that all official volunteers have distinctive clothes for identification. Carlos has no special clothes but does have a nametag for identification. This is explained in a more recent video of Alexander Arredondo's id which identifies him as a member of the Disaster Services Human Resources (DSHR), a part of the American Red Cross. (17) Is it just a coincidence that he is at the right place and the right time? There is also another photo (PHOTO H: CARLOS WAITS FOR CUE?) taken earlier than the wheelchair photo showing Carlos apparently waiting quietly next to the place where the alleged fake amputee is being prepared. Criticism of the crisis actors thesis. There was a drill on the day of the marathon. There were spotters on roofs and dog sniffing teams. There were announcements made about the drills. 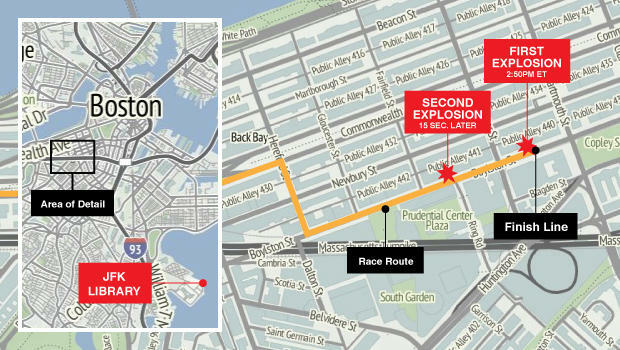 There were two tweets from the Boston Globe on their marathon update page that "authorities have announced that a controlled explosion will take opposite the library in 1 minute" (this was two hours before a bomb went off at that exact location). The FBI have admitted that they had been in contact with the two brothers for about 5 years. Nonetheless he does not accept that there were crisis actors at the scene. He has discussed these issued with doctors and insists that the femoral arteries of the man in the wheelchair have not been severed since his knees are intact. This explains why blood is not spurting out. He also notes that "arteries are sphincteral, that is to say, they spasm and contract when severed. This appears to be a natural life-preserving function of the body to prevent blood loss." So if they are severed they close down to prevent blood loss. Was one of the bombs fake? While some of the points raised by Quinn are cogent, there are two major problems with his criticism. 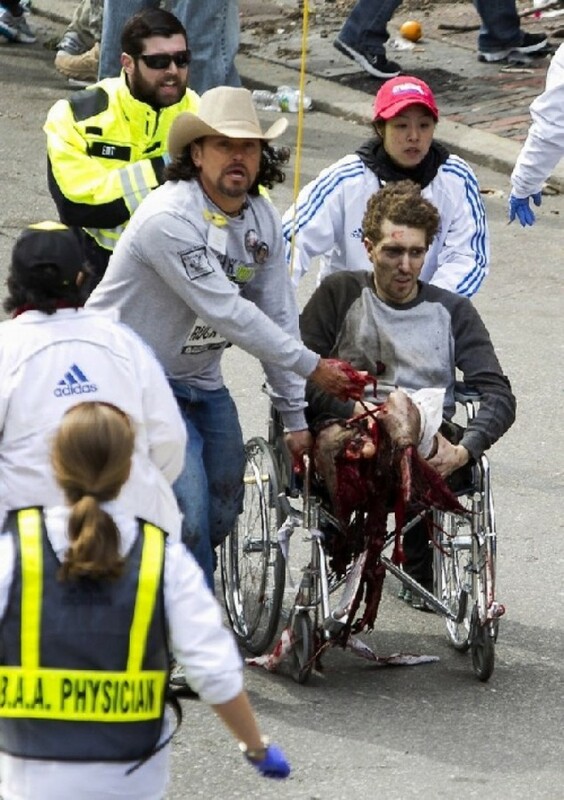 First, he assumes that the man in the wheelchair is Jeff Bauman, since many of the critics have assumed this as well. They argue that since the man in the wheelchair is Jeff Bauman, and this man is also an actor, "Jeff Bauman" had no legs before the Marathon. Quinn replies that we know Jeff had both legs before the Marathon, so the injuries shown in the wheelchair photo cannot be fake. However, if the man in the wheelchair is not Jeff Bauman, both opposing views are based on the same false assumption. The second problem is that he does not consider there might have been two different explosions at the end of the Marathon. One of them was real, and one of them was fake, just a flash, sound and smoke. Quinn provides a clip to show that the bomb - like the victim - is "real", but the explosion shown in that clip is the fake bomb. He uses PHOTO I: RUNNER STANDING BY EXPLOSION to show a runner looking at the site of the explosion where the photos used above were taken. One interesting video shows how at the site of the first explosion, where an alleged fake amputee is seen, there was later no serious bomb squad investigation, while at the second explosion there are many investigators in their white suits. The claim is that the first bomb was fake, while the second one was real. This second site is the one which interested the authorities. It is also claimed to be the site where all the injuries were caused. (22) If one of the explosions was fake, this provides good reason to believe that the "bomb backpack" shown in Part 1 was not used for the second explosive device, but it could have held the first (fake) bomb producing only noise and smoke. The second bomb would have blown a backpack into microscopic particles. Why didn't sniffer dogs detect the black powder bombs? How many people were injured by the bombs? The figure of 54 victims, while much lower than later numbers, is twice the number originally given. "The original injury count in the immediate wake of the BMB, which was reported as a much less sensational 23 injured and two deaths... (are) figures in rough accord with the number of individuals whose images were recorded on CCTV and surveillance cameras involved in and around the initial blast that exhibited ostensible injuries. "(26) Certainly the deaths and injuries for the 54 people reported at the Boston.com site are a tragedy, but how do they, or any of the other spectators and participants, gain from the apparent victim inflation? In the light of the earlier question, it is also important to know where each of them was at the time of the blasts. Part 3 (http://australianvoice.livejournal.com/3613.html) will suggest alternative scenarios based on Parts 1 and 2. 10.This photo taken from a site which is no longer available: https://lh3.googleusercontent.com/-Kz_P_KbQOO0/UXo0d5z1MSI/AAAAAAAACRc/P8eq-Mnb9RI/w1400-h712/jeff+baumann.JPG. There are other photos of this scene at other sites. 12.http://aworldofmakebelieve.files.wordpress.com/2013/04/jeff-bauman.jpg. This site disappeared. Later the same two pictures could be found here: http://pbs.twimg.com/media/BJsDxG6CUAAjBpg.jpg, but the image is now no longer available there either. 13.http://pbs.twimg.com/media/BJsDxG6CUAAjBpg.jpg. This site no longer available and I cant find original article from which the passage is quoted. 14.http://buelahman.wordpress.com/2013/04/20/are-you-just-a-believer-or-do-you-think/. 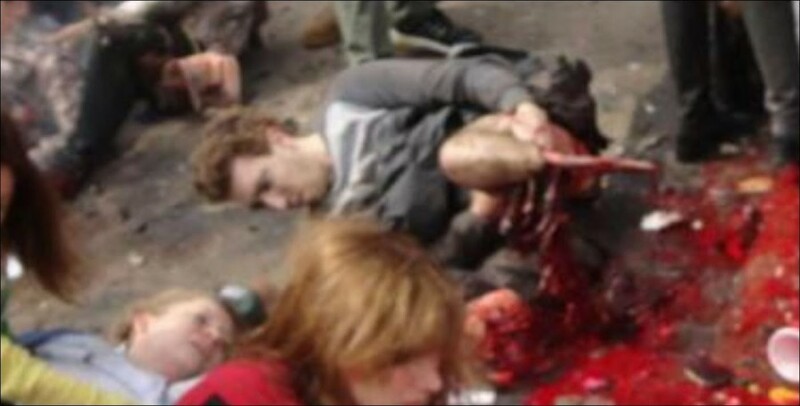 The claim about the fake injuries is also made here: http://www.bbmisc.com/forum/showthread.php?20697-Boston-Bombing-Actor. 15.http://www.trentslist.org/wp-content/uploads/2013/04/Jeff-or-nick.jpg. This site no longer available. 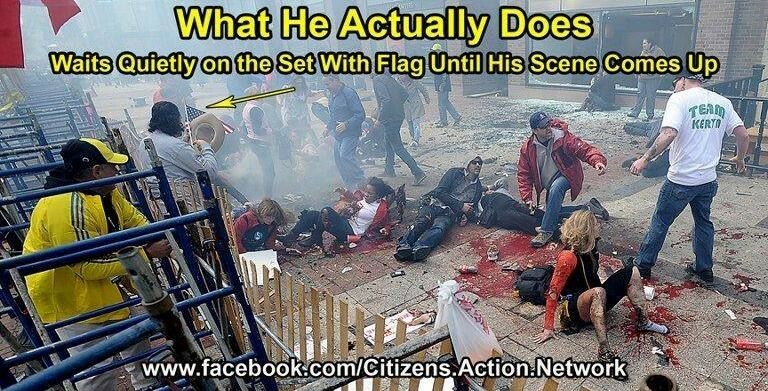 Many of these points are made at the following site: http://makahamommy.blogspot.com.au/2013/04/boston-bombing-series-actors-on-scene.html. The author of this article does not doubt that the person in the wheelchair is Jeff Bauman, so concludes HE is a fake victim. This is by no means certain. 16.http://www.trentslist.org/?p=645. This site is no longer available.